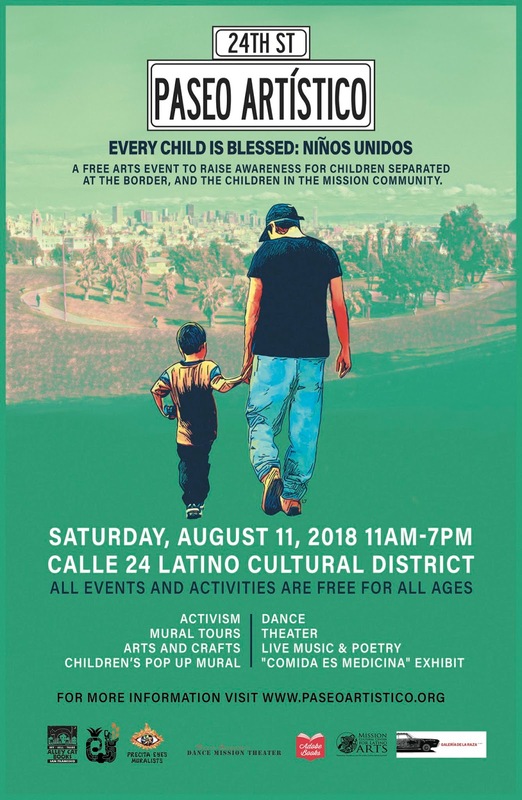 A free arts event to raise awareness for children separated at the border, and the children in The Mission community. All events and activities are FREE for all ages. This month’s Paseo Artistico aims to raise awareness about children and their families separated at the US-Mexico border, as well as highlight the value of children in our local community. Live music and dance from Latino, indigenous, Hip-Hop, and tropical artists, poetry and literary arts from Central American authors and writers, as well as indigenous food demonstration, interactive arts and crafts workshops for all ages will be presented for free to the entire community. Precita Eyes - 2981 24th St.
Alley Cat Books - 3036 24th St.
Accion Latina/Juan Fuentes Gallery —2958 24th St.
Dance Mission Theater — 3316 24th St.
Adobe Books — 3130 24th St.
Galeria de La Raza — 2857 24th St.